On Saturday March 30th, Elected Representative for Constituency #3 (West Basseterre, West Farm, Boyds and Trinity) made a well-received donation of $15,000 to his home team, the RAMS Village Superstars Football Club. In speaking on the occasion on Saturday afternoon, Konris recalled his partnership with and contribution to the team which began as far back as ten (10) years or so ago. ‘Since shortly after completing my university studies, I have been actively involved in Village Football.’ Konris has been an Executive member of the football club and over the years has taken on many initiatives to assist the team. Konris was responsible for resurfacing the Patsy Allers Playfield, a playfield that one can call the home base of the RAMS Village Superstars Football Club. Konris has also been involved in taking players to train on the beach at early mornings, hosting team lunches and making financial contributions over the years. Konris Maynard, who goes by the calypso name ‘King Konris’, has used his craft in the calypso artform to promote the team by rewriting calypso/soca songs for the team. Young Maynard who many young people see as a positive role model, has been mentoring and supporting players and providing moral support in the locker room for the team. ‘I am a VILLAGE FAN’, Konris acclaimed. 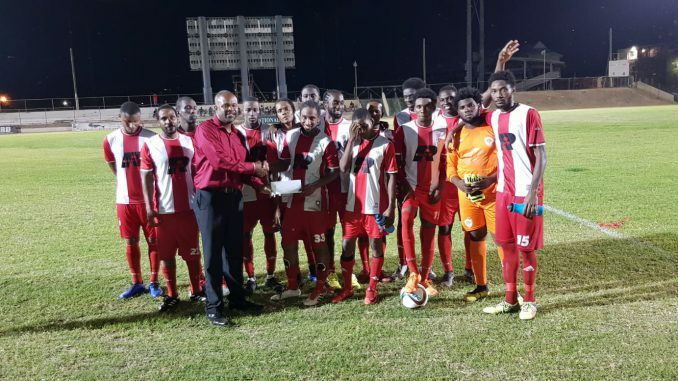 ‘It therefore gives me great pleasure in continuing my support with a $15,000.00 donation to the Village Superstars FC as they prepare to participate in the Caribbean Shield CONCACAF 2019 Tournament in Curaçao in April. This is a great opportunity for our players and our country, and I wish the team the BEST as they strive for Football Excellence!,’ concluded Konris Maynard.